In an afternoon keynote at CES 2015, Intel‘s CEO Brian Krzanich bounced on stage to pass out some slightly platitudinous statements about the future of technology, and to bring the audience dancers, a cello, and what appeared to be a boy band, all fused to trippy lights. 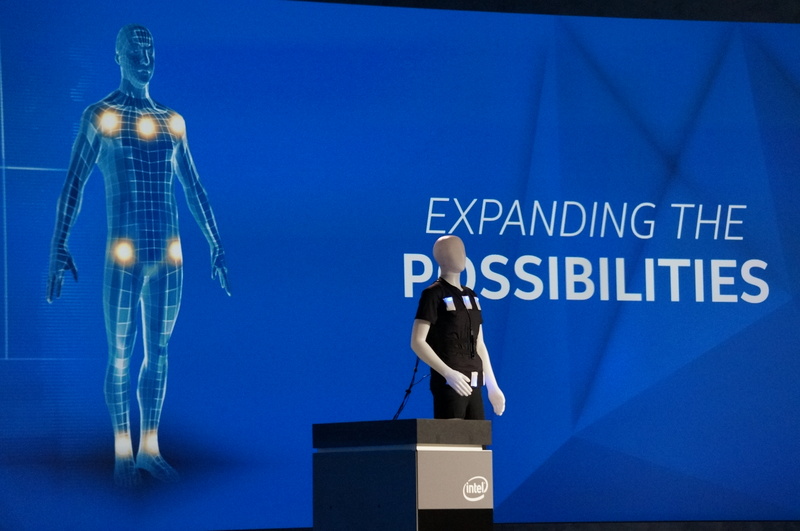 The most important part of the keynote came at the end, however, when Intel pledged to spend $300 million to bring its workforce diversity up to “full representation” of women and “underrepresented minorities” by 2020. Krzanich stated that “Intel will lead by example” on the issue, though he also noted that the lack of diversity in technology is something that the full industry must work on, and not just his company. To reach its goal, Intel will hire differently and tie executive pay to performance on the issue. The latter will likely ensure that those who make hiring choices obey the former. Krzanich also promised transparency on its progress. The main cutlet of the presentation saw the CEO outlining three forces that, in his view, will shape the future of technology. They are somewhat simple to understand, so let’s take them each in order. “Computing Unleashed:” In the view of Krzanich, computing is going to shift from a two-dimensional experience, to a three-dimensional experience. This meshes with other trends that have been seen in recent years, including three-dimensional televisions, and some work in gaming. He also stated that “computers are gaining senses,” something that “will result in their ability to understand.” Krzanich is correct in that computers are becoming increasingly sensory. But — and as we will see shortly in his other points — sensors are proliferating everywhere, so the point becomes correct from both directions at the same time. Krzanich noted a Dell tablet, and a camera, both which use the company’s “RealSense” technology to bring three-dimensions into the consumer space, implicating photography and the like. Intel also spend some time discussing wireless powering, for the second year running. Last year, the company showed off a bowl that had wireless charging technology. This year, it showed off a tablet that had the same capability. “Intelligence everywhere:” Intel stated that the Internet of Things is in fact not a new concept, but was instead something that has been around “for years.” Intel also pointed out that the things that make the Internet of Things what it is — increasingly intelligent, connected objects — are growing in sophistication. Krzanich then brought out a robot that had a screen showing off the face of a human, and then a host of drones that sounded like that bees nest you stepped on when you were a small child. Importantly, the CEO coined a new phrase: Drone ping-poing. The company ran a drone through an obstacle course and then showed a clip of drones flying through trees. Intel really likes drones. Along with the Quark SE chip, Intel is releasing a development module called Curie. The platform is designed to have all the features that are necessary for developers who are hoping to build their own wearables, including low-power Bluetooth connectivity, motion sensors, and battery charging. Intel wants to sell chips to the people that sell you things. The firm certainly appears to be putting quite a lot of development work into building the guts of future wearables and other similar devices. Intel hit on similar tones as other firms have this year at CES. That said, it seems to have technology in hand more so than some, which means it could be in a decent position to work aggressively to grow and maintain share in the expanding, but increasingly small world of computing.